Chath PierSath is a Cambodian artist, poet and activist. After discovering that making art helped him to channel his emotions brought about by a childhood under the Khmer Rouge, the self-taught artist has used his paintings, collages and poems to reconnect fractured memories from his past. Over time, Chath’s work has enabled him to make sense of himself and the world around him. His work is the product of a difficult history, a keenly perceptive eye, and a desire for change. In 1980, at the age of ten, Chath fled from his homeland to the United States. In 1994 he returned to Cambodia for the first time and has since been living between his adopted home country and Cambodia, where he works as an artist and social worker. Chath began to paint as a way of exorcising his memory of war and violence. He also uses art to work with people who have been traumatized by war, social inequity and injustice. Chath PierSath avoids directly painting the horrors he remembers from his childhood. Rather, his artistic process, which is guided by personal thoughts and observations, strives to build connections between aspects of his past which were taken away. The message of his work is clear: the story of Cambodia, both past and present, is interlinked, complex and often dark. Chath PierSath is not a painter in the classical sense. The main focus of his production is his own obsessive search for images, with which he aims to reconstruct a past that was violently erased from his personal life. He often paints erasure. PierSath’s unique and new art practice is closer to performance art than classical painting. The resulting works are segments of a greater puzzle which he endlessly attempts to solve, and probably never will. By attempting to create segments of the puzzle, PierSath utilizes mainly images that are created independently from him. He borrows images from news media, advertisements, photo novellas and the Internet. He cuts and pastes these images, and paints and draws his own fragmented memories over them, as well as present-day recordings of his everyday life. The resulting work alludes to further visual fragmentation, instead of completion. The work can never be achieved. In that, it becomes a metaphor for life. Chat Piersath, Untitled, 2010. 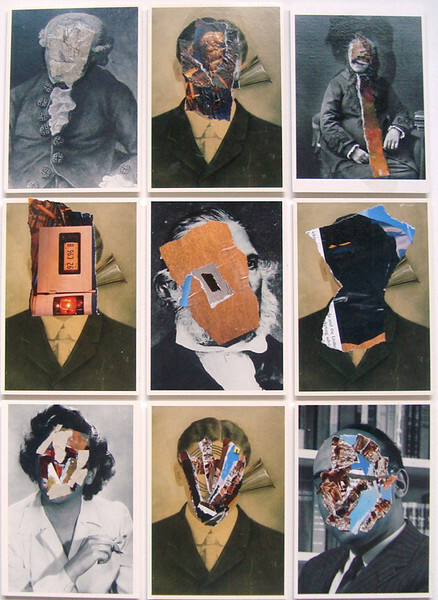 Collage on postcards, 18 x 24 in.